TARDIS has the ability to add your own custom rooms using TARDIS schematic files and the /tardisroom command. Custom schematics created with the /tardisschematic command are automatically saved in the plugins/TARDIS/user_schematics folder, if you have got a schematic from somewhere else you will need to manually put it in the correct folder on the server — it should be called [something].tschm. [something] is the name of the room/schematic file and MUST be lowercase. [cost] is the Artron Energy cost to grow the room, and must be a POSITIVE number. [offset] is how far below the door position the schematic extends, and must be a NEGATIVE number e.g. -1 (if your floors don’t line up then you got this wrong) See image below. 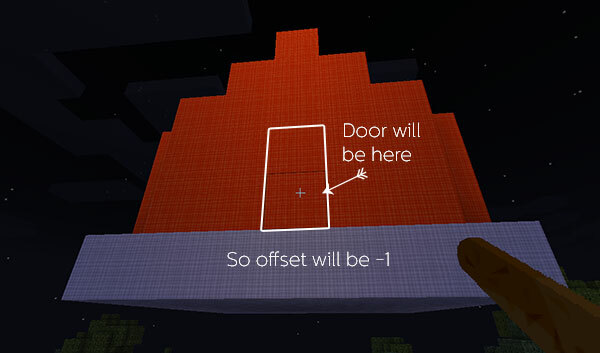 Most of the time (allowing for the default redstone door circuits) this will be -4. The last command enables the room. A room template with the correct door circuits is supplied with the plugin. You can load and paste it into a world with the /tardisschematic command and then modify it as needed. Note: This video is very outdated! The plugin no longer uses WorldEdit schematics and rooms should be grown with ARS. The video shows also the custom room schematic being put into the schematics folder, but it sould now be put into the user_schematics folder.